Abandoned and forgotten places all have stories. Some are known, but most will forever be sealed within. 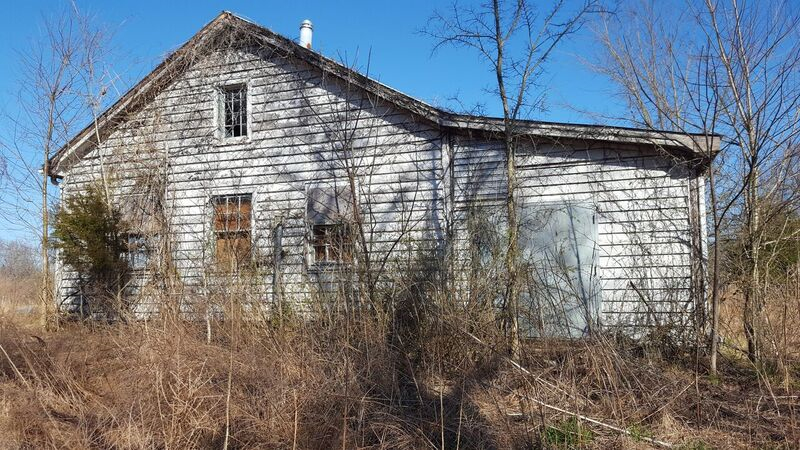 Here we showcase some of the Abandoned & Forgotten places in the Four Rivers area. Land Between The Lakes National Recreation Area was once home to over 2,000 families and several small tight-knit communities. The Tennessee Valley Authority took over the vast 170,000-acre peninsula between Kentucky Lake and Lake Barkley in the 1960s. TVA purchased the land from the families and many of them found new homes in nearby communities. One resident, however, refused to move. 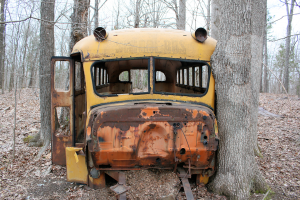 A few weeks ago, Lisa Trimble, a Facebook fan of Four Rivers Explorer, sent me a photo of an old abandoned school bus in Land Between The Lakes. I asked Lisa regarding the whereabouts of the bus and she gave me some good information on how to find it. The location is a popular hunt for geocachers and actually has a name on geocaching.com – Homer’s Garage. 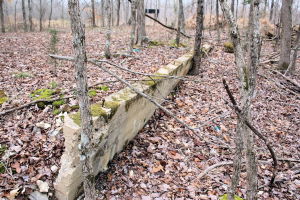 The remains of a foundation which could have been Mr. Ray's garage. 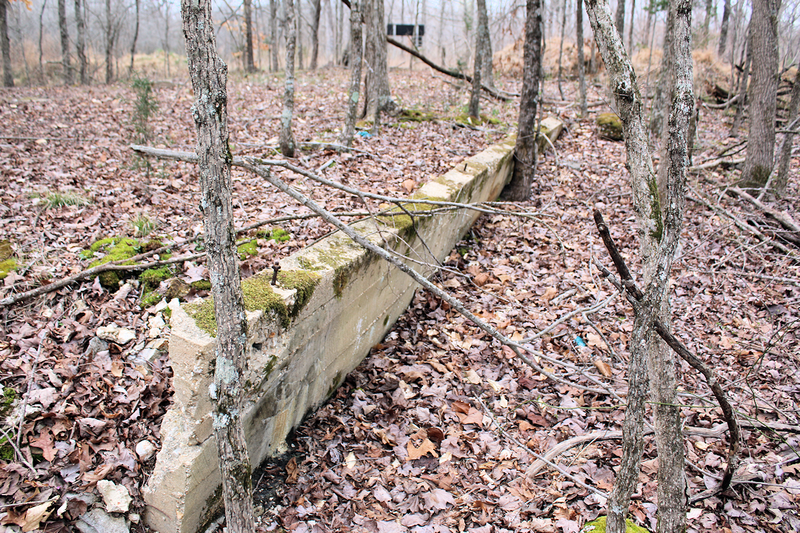 Finding skeletal remains of civilization in Land Between The Lakes isn’t rare. 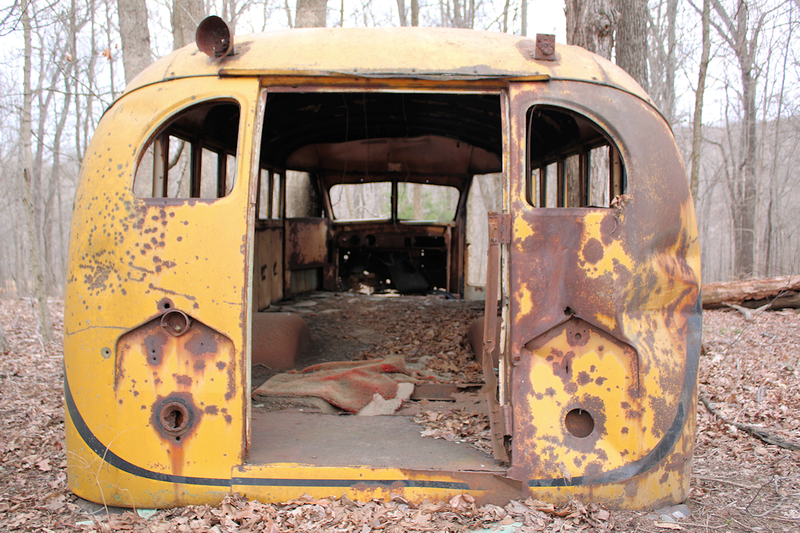 However, a stripped down school bus is a one-of-a-kind discovery. 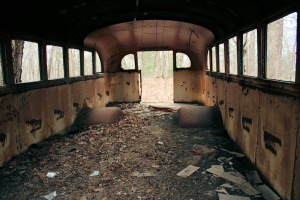 Despite the fact that the old bus is odd and usual, it’s history is not much of a mystery. According to geocaching.com, the name Homer’s Garage comes from Homer Ray, a former resident of Land Between The Lakes before it became a national recreation area. 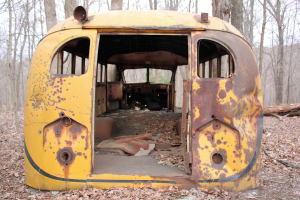 Mr. Ray owned Ray’s Garage, a shop located where the remains of the bus is today. Mr. Ray was one of the last people to leave Land Between The Lakes in 1969. He relocated to Eddyville and operated a garage there until his death in 1981. Much of the land surrounding the former site of Homer’s Garage was owned by his family. Mr. Ray’s father, Cordie, operated the Kuttawa Ferry across the Cumberland River. Ray and many of his family members are buried in Sardis Cemetery in Land Between The Lakes. Trees are beginning to grow around and into the bus which has been sitting in the same spot for around 50 years. 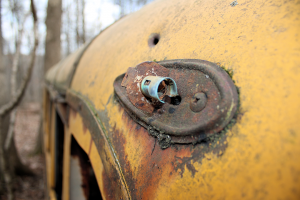 I am not an expert at identifying old cars, let alone a bus that is 60 years old. It appears to have belonged to the Lyon County School District; you can see faint lettering on the bus reading "Lyon County". 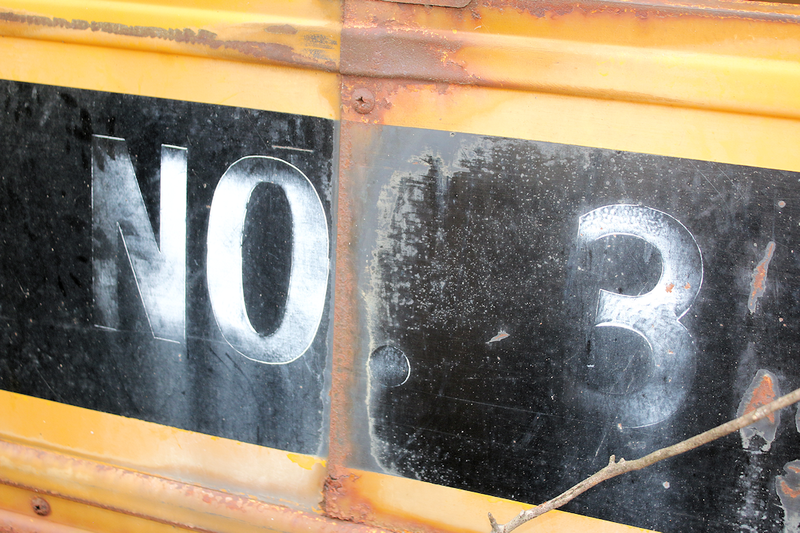 It also appeared to seat 32 people, with eight seats on each side of the bus. It's been striped of virtually everything, leaving only the shell. If you think you know what year, make and model of the bus is, feel free to comment or email me. Getting to the bus is not difficult. It is located in northern Land Between The Lakes. 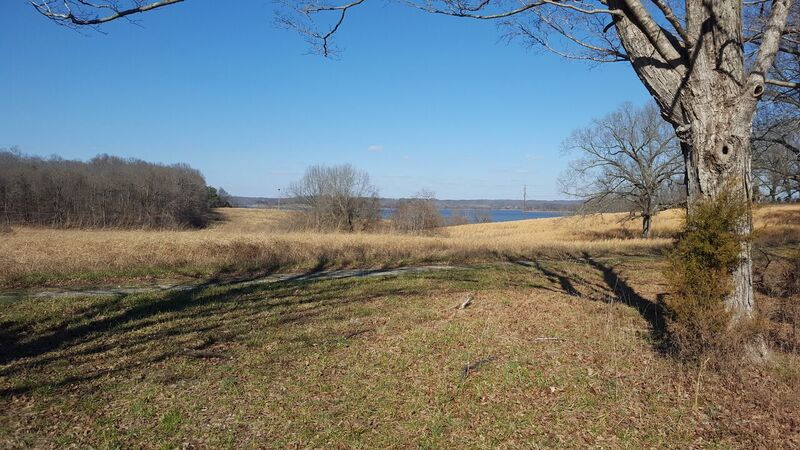 From the Trace, take Old Ferry Road and go about 6.5 miles to LBL Road #126. Take that road and travel about a half mile until LBL Road #126 splits into #127. You’re in the general area. Find a place to park on the side of the road . There is an old driveway with a mound of dirt and gravel near a modern road sign. Take this path and head into the woods about 500 feet or so. You’ll see the bus in front of you. The bus can be spotted from #126 in the winter months. As always, leave no trace! In the warm months, make sure you watch where you step and check yourself for ticks. There is a geocache at this site. You can get GPS coordinates for Homer’s Garage at geocaching.com. Here's some pics I took of the old bus. 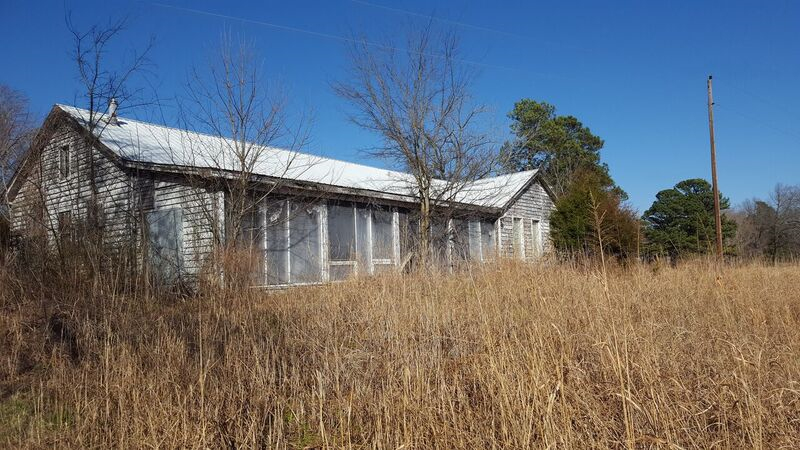 Empire Farm is an abandoned farming educational and demonstration area in Land Between The Lakes. 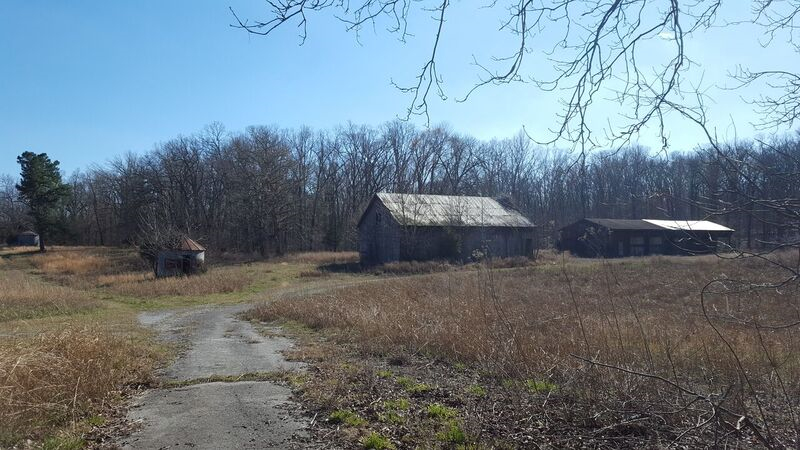 Empire Farm once served as the headquarters of the Kentucky Woodlands National Wildlife Refuge in the 1930s. The refuge covered large swaths of land in the northern portion of present-day Land Between The Lakes. When Land Between The Lakes became a National Recreation Area in the 1960s, Empire Farm became an agricultural education center until sometime in the 1980s. 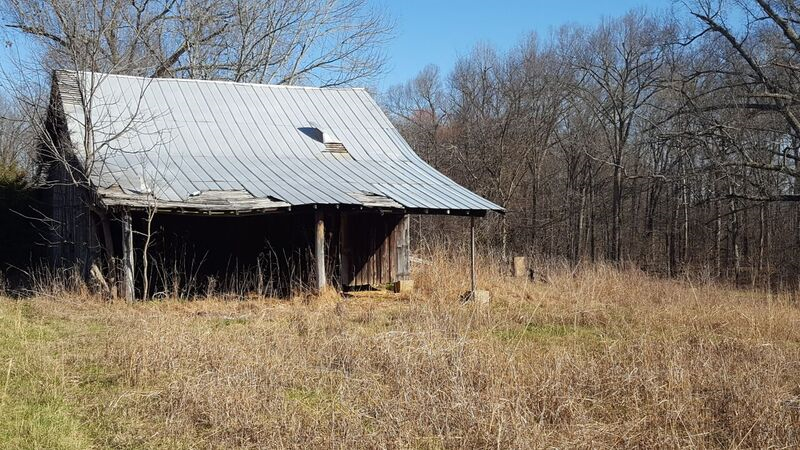 The fields today are still maintained by cooperative farmers, but the buildings and barns have been abandoned for quite some time. 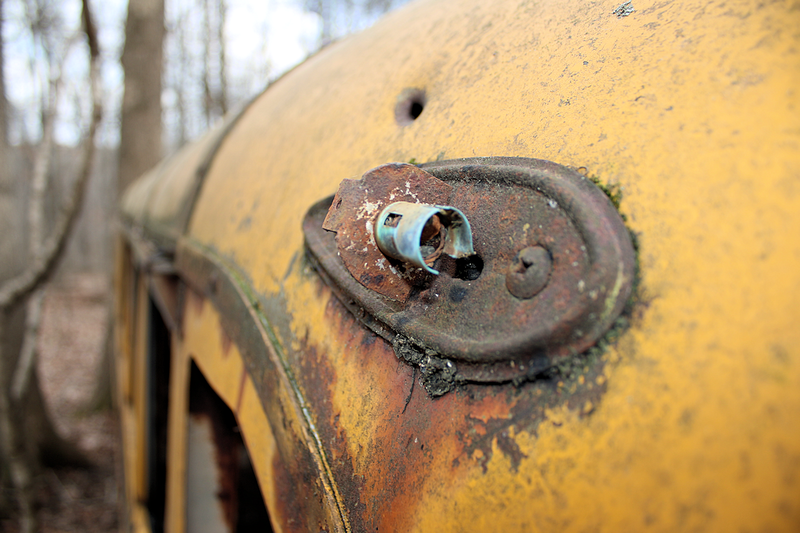 Crystal Akers recently sent us these photos of her own personal exploration of Empire Farm. If you want to explore this area for yourself, see the Google Map below the photos for directions. Thanks again to Crystal Akers for the great photos. This area is located in the northeastern part of Land Between The Lakes near the abandoned Silo Overlook. 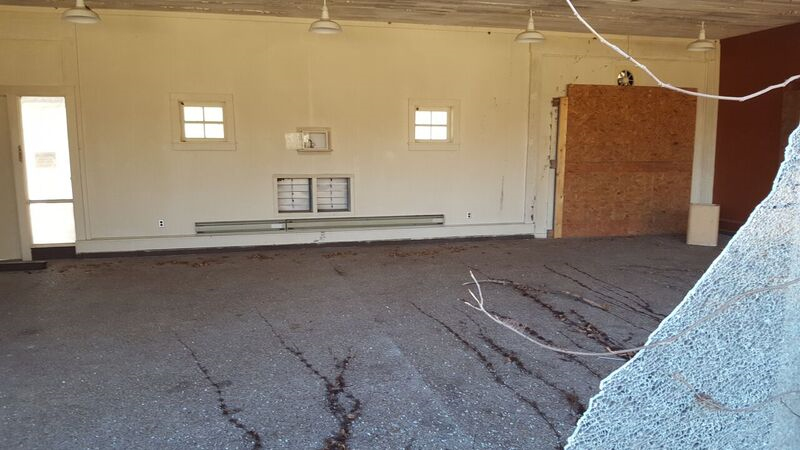 While exploring the historic community of Canton, we discovered this abandoned filling station on the old main drag through town. A sign painted across the top of the windows and garage door read "Tires, Free Air & Accessories." The building had a marker near the top proclaiming to be constructed by the Masons in 1919. © 2006-2019 Explorations Media Group, LLC. All Rights Reserved. Four Rivers Explorer is brought to you by ExploreKentuckyLake.com.